The Soul is the individuated expression of Spirit. 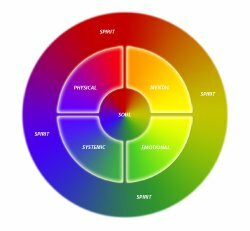 The Soul emerges through the physical, mental, emotional and systemic qualities of the human being to manifest the individuated expression of Spirit. The mental experience informs the emotional and visa-verse. The emotional and physical often manifest the qualities of the other. The systems to which we belong often have a great effect on all realms of the individual experience. Thus, one can explore the deeper meanings of experience; whether physical, mental, emotional or systemic by viewing life as lessons and opportunity for Soul growth. The deeper, intuitive self is in synchronicity with the spiritual evolution and events, internal and external, that remind us daily of the innerconnectedness of all of Creation. The Soul is understood by many faith traditions to be the aspect of the self that lives on past this lifetime; the essence of the human that moves beyond this aspect of existence. One might say that it is the Soul that moves into transcendent experience, bringing the experience into the realm of the individual through all four quadrants of being. It might be said that the Soul does not reside in the body but that the body, the human, resides within the Soul.